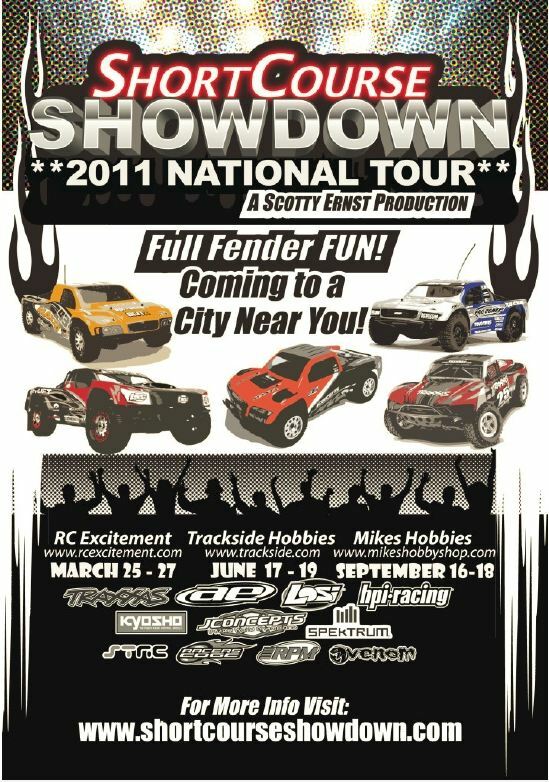 Short course trucks have no doubt changed the landscape of RC Racing as we know it and this year we will take our style of SC racing on the road. This past year we held the Short Course Showdown at Trackside Hobbies in Milwaukee Wisconsin and it turned out to be the biggest and best SC race in the country. The event backed by all the major SC companies in the industry was a showcase of the SC racing world and we are now taking it on the road. The intent of the SCSNWT is to bring our style of event to different venues around the country and allow as many people as possible to enjoy this exciting and fun form of racing. This event is not a series, but 4 individual races held at some of the best tracks in the USA. Each event will consist of practice on Friday, qualifying on Saturday and mains on Sunday. We invite everyone to join us for this exciting tour of racing where fun will be the focus and you will have a chance to meet some great people. Win lots of prizes and share in the fun of Short Course racing.